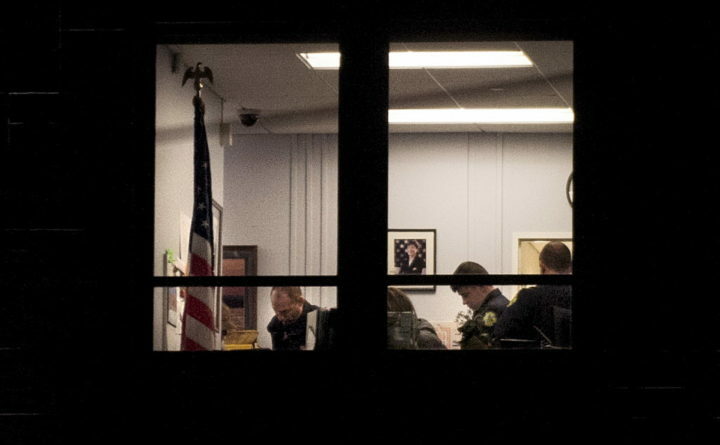 Bangor Police officers are visible in U.S. Sen. Susan Collins’ Bangor office as they are arresting people who staged a sit-in protest at the Margaret Chase Smith Federal Building in Bangor Monday. Five protesters were arrested Monday night after staging a sit-in at U.S. Sen Susan Collins’ Bangor office over her support of a Republican bill to overhaul the federal tax code. The sit-in, which began Monday afternoon, followed other protests around the state over the weekend in response to the Republican senator’s vote last week in favor of the bill that critics say is unfairly tilted toward the very wealthy and would increase the national debt. “We are staying until we talk to Senator Collins by phone or in person unless we are arrested,” protester Jim Betts, 66, of Winthrop said just before 5 p.m. from inside Collins’ office in the Margaret Chase Smith Federal Building. “I’m shocked Senator Collins would buy into that [bill],” he said. Around 6 p.m., one of the protesters, Sarah Bigney, tweeted that she could hear members of the Bangor Police Department communicating with Collins’ Washington, D.C. staff by speakerphone about how best to deal with the situation. About an hour later, police entered the room in Sen. Collins’ office where the protesters were waiting and gave a statement, according to a video live stream posted on Bigney’s Facebook page. “You are occupying the premises unlawfully and without permission and in violation of trespass. I am ordering you to leave the premises. If you do not leave, you will be arrested,” Bangor Police Department Sgt. Myron Warner said in the video. Refusing to leave, the five were then escorted out the back entrance of the building and into police vehicles. Those arrested include Betts; Erin Oberson, a nurse at Eastern Maine Medical Center; Nick Paquet, an electrician; Tina Davidson, a disability rights activist and veteran; and Bigney, of the Maine AFL-CIO, which organized the protest, along with Mainers for Accountable Leadership. It is not clear whether the five will be prosecuted. The Penobscot County District Attorney’s office has tended to not prosecute protesters. Collins was in D.C. at the time of the sit-in and did not communicate with the protesters, but they spoke with her staff in her Bangor office for more than an hour, Annie Clark, Collins’ communications director said just before 5 p.m.